Got this one back from a 50/50. 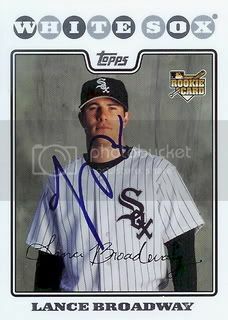 Lance Broadway was recently traded from the White Sox organization to the Mets. This former first round draft pick is currently playing for the Buffalo Bisons in AAA. Best TTM yet: Vladimir Guerrero. The 8x All-Star and 2004 AL MVP is a great addition to our 08 Topps set. I've gotten Vladimir's autograph before. 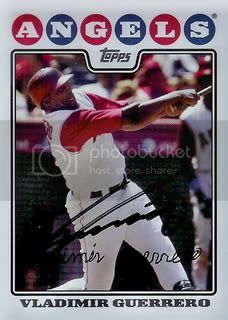 He was a pretty good TTM signer back when he was with the Expos but stopped signing when he went to the Angels. I was really surprised to get this one back last week. 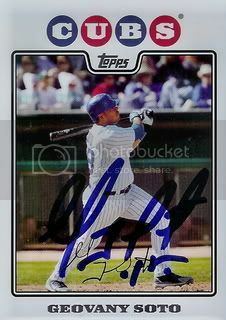 2008 NL Rookie of the Year, Geovany Soto signed a card for our set. I was happy to get this one back. Geovany had a great season last year for the Cubbies and was even voted onto the All-Star team. 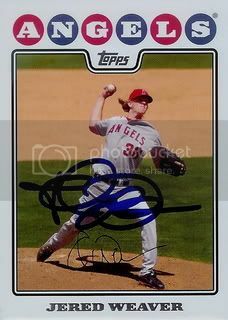 Jered Weaver! 10-3! 3.48 ERA! Signed my 08 Topps card! Wow! The last time I highlighted an Award Winner was May 31st. 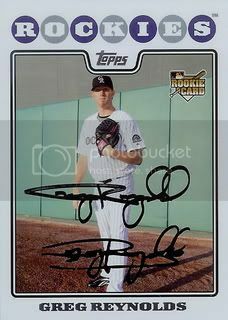 I guess that's partially due a steady gain of signed 08 Topps cards and partially due to me finding it harder to update this blog. 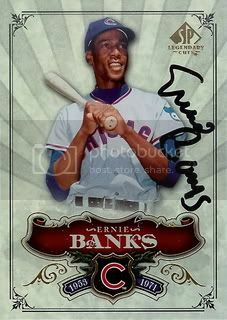 Earlier this year I received a card back TTM signed by Mr. Cub himself, Ernie Banks. This card instantly jumps into my all-time top ten favorite autographs. Ernie was an eleven time All-Star, two time MVP, and even won a Gold Glove. In 1982, his # 14 was the first number ever retired by the Chicago Cubs organization. He is a member of the 500 Home Run Club and probably the best player to ever put on a Cubbie uniform. 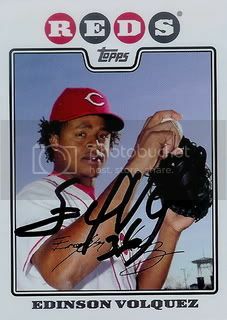 Edinson Volquez had a great year last season for the Cincinnatti Reds. Unfortunately he has spent the majority of this year on the disabled list. Hopefully he'll be back to the form that help him put up a 17-6 record with 200+ strikeouts in 2008. 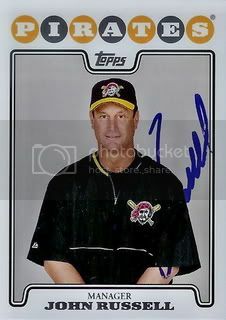 Former big league catcher and current Pittsburgh Pirates manager, John Russell signed a card for our set. The most noteable moment from John's playing career has to be catching Nolan Ryan's 6th career no-hitter. 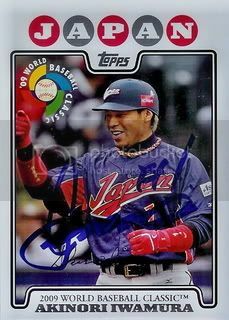 Back in June, Akinori Iwamura signed his basecard from the 2008 Topps set for us. Today, he signed his World Baseball Classic insert card. Since this isn't part of the regular set, it doesn't count towards our progress but it's a cool card none the less. One of my favorite things to do each year is to check and see how many of the All-Stars I have autographs of. I usually have most but there always seem to be a few Mets that I don't have in my collection (J. Santana, F. Rodriguez). There were a few first time All-Stars that I was glad to see on the roster for 2009. Guys like Justin Upton, Adrian Gonzalez, and Felix Hernandez. And a few old favorites like Dan Haren, Josh Hamilton, and Trevor Hoffman. Below are the six 2009 All-Stars that we have a signed 2008 Topps card of. Hopefully next year, there will be two or three times as many. Today brough 2006 First Round Draft pick, Greg Reynolds. 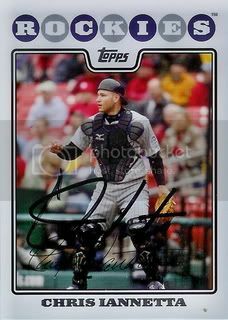 The Colorado Rockies selected him # 2 overall in 2006 (ahead of Evan Longoria). Another catcher back today. This time Chris Iannetta from the Colorado Rockies signed a card in black Sharpie for our set. I remember all of the preseason fantasy talk was about Chris Iannetta was the guy to pick up at catcher. As of today, Chris is hitting .231 with 10 home runs. Not horrible but no All-Star. I have a feeling 2010 will be Chris's breakout year! More mail! 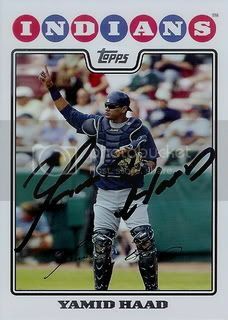 Today brought a signed card from former Cleveland Indians catcher, Yamid Haad. Yamid is now with the Seattle Mariners organization and is currently a member of the West Tennessee Diamond Jaxx. I actually got this one back a few weeks ago but somehow it ended up in the wrong pile and never got scanned. 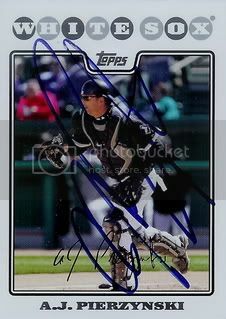 Anyway, it was great to get a signed card back from AJ Pierzynski. AJ is a fine catcher but two oddball moments stick out in my mind when I think of him. Of course the first is the called third strike during the 2005 World Series. The second is when Michael Barrett punched him the face. A few years back my family started watching the Nathan's Hot Dog Eating Contest. Somehow this has turned into a tradition each year as we cheared on Takeru Kobayashi as he demolished the competition. 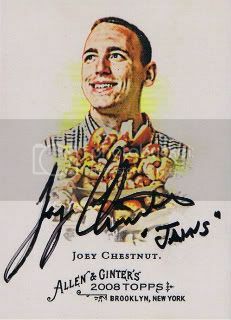 The past four years have been even more exciting with the emergence of Joey Chestnut. I'm not sure why but there's something entertaining about watching grown men shove 60+ hot dogs in their mouth. 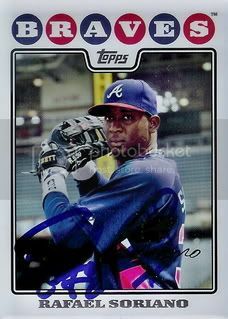 Former closer and current Atlanta Braves set up guy, Rafael Soriano signed the card below for our set. 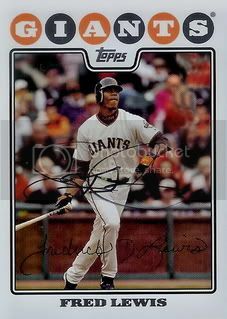 San Francisco Giants outfielder, Fred Lewis signed the card below. Another nice addition to our set.